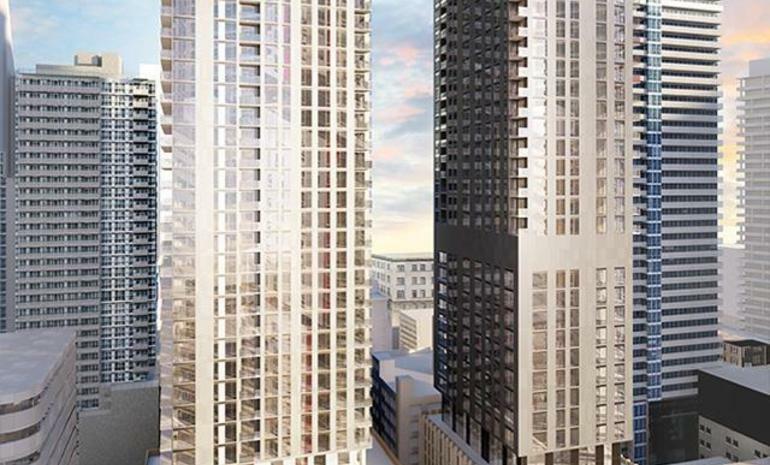 Encore Theatre District Condos Toronto is a luxuriously appointed project, situated near the Old Toronto. It is a new condo which is currently in preconstruction phase. Its development is undertaken by Plaza. The building comes with a captivating and vibrant view with its estimated completion scheduled in 2022. The project comes with Encore Theatre District Condos 210 units and with 48 storey buildings with size ranging from 509 to 1261 square feet. Its ceilings are at a height of 9 inches from the floor. This project not only gives a picturesque view but also provides a perfect transportation option. Interiors are designed by skilled, qualified and famous architects named Quadrangle Architects. The place is a package of everything you need and want. Encore Theatre District Condos amenities inside the campus include Yoga Studio, Party Room, Outdoor swimming pool, Steam room and a Fitness centre. For transportation, there are bus stops like Union Station Bus Terminal (1.7km), Toronto Coach Terminal (1.6km) and Standard parking bus station (2.3km). Even railway stations are not far from this place. Some of the closest ones include – Union Station, Exhibition and Kipling. Navette pour Bishop Airport, Porter FBO Limited, Billy Bishop Toronto City Airpot is some of the famous airports that can be found close by. Encore Theatre District Condos 28 Widmer Street, Toronto is the most advantageous project in the perspective of its location. For hospitals, you could walk to Emkiro Health Services (0.8km), Infinity Health Centre (1.2km), Medcan (0.7km) and Patient Networks Family Medicine Walk-In Clinic (1.4km). It has some of the most privileged educational institutes like The Ritz Carlton Toronto School, SoHo Metropolitan School and Thompson Toronto. Parks to enjoy the walk and serenity of nature namely; Wychwood Barns Park(5.8km), Trinity Bellwoods Park (2.7km)and High Park (8.3km). For pharmaceuticals shop, you do not have to go far. Some of the shops such as Shoppers Drug Mart, and Loblaws pharmacy. 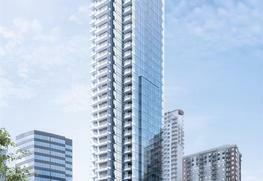 Encore Theatre District Condos location contains every kind of diversions for fun and leisure. For your entertainment and relaxation there are malls – Dufferin mall, First Canadian place and CF Toronto Eaton Centre; different cuisines can found in – Hotel Ocho, The Rex Hotel Jazz and Blues Bar, Hotel Novotel Toronto Centre, The Drake Hotel and Gladstone Hotel; movie theatres too – Tiff Bell Light Box, The Royal and Imagine Cinemas; and not to forget bars which include – Crocodile Rock Bar and Buca Bar. This condo is under the development of Plaza, which has been presenting an excellent workpiece. The Plaza projects have constructed, managed and developed both commercial and residential properties and gave a new meaning to urban living. They are dedicated and do their job with utmost interest. They acquire a bunch of skilled workers and expert engineers in their organisation who understand the value of your money and have the desire to listen to the all the details that you want to bring in the project.